SOURCE: Red Mountain Retail Group, Inc.
SCOTTSDALE, AZ -- (MARKET WIRE) -- April 5, 2007 -- 4020 Scottsdale Old Town Lofts, a "vintage building meets modern luxury living project" in the heart of Old Town Scottsdale, has released details for its initial offering of 21 luxurious, boutique lofts located directly above upscale retail shops. Construction is expected to begin at the end of April, with a scheduled completion date of December 2007. These lavish lofts and chic retail spaces were designed by Architekton of Tempe, and the Richardson Design Group of Salt Lake City. The lofts are being crafted from the existing three-story commercial building by Red Mountain Retail Group, Inc. (www.redmountainretailgroup.com), a development company headquartered in Santa Ana, California. Located on the northwest corner of Scottsdale Road and 1st Avenue, Scottsdale Lofts are in the heart of Old Town Scottsdale, a historic atmosphere with modern amenities. An eclectic mix of southwestern and contemporary art galleries, specialty retail, upscale dining, and an active nightlife are all located within a short walking distance of the lofts. The new Waterfront development and Scottsdale Fashion Square are also within a short strolling distance. "We're excited about this mixed-use project and delighted to have found this unbelievable location in Old Town Scottsdale," said Michael Mugel, CEO of Red Mountain Retail Group. "People from all over the world come to Scottsdale -- and especially Old Town -- for the galleries, shopping and night life. Now they can own a home in the heart of this unique mix of the Old West and modern urban lifestyle. This is the first true 'loft conversion project' taking an existing commercial building and converting it to residential in Scottsdale and we are thrilled to offer this opportunity to potential home owners and retailers." These well-appointed residences will range in size from approximately 800 square feet to over 1,200 square feet and will feature oversized balconies for the creation of an outdoor living space. 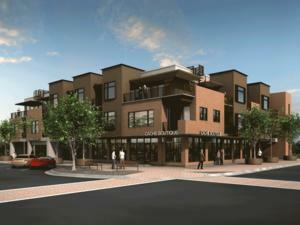 Some units will feature rooftop terraces on the third floor with views of Old Town and Camelback Mountain. Interior finishes of the lofts will be upscale contemporary, featuring high volume ceilings, individual gas heat and air conditioning, professional quality stainless steel kitchens with designer cabinets, and granite countertop options. All Master suites include walk-in closets. Prices start from the low $400,000 range. Scottsdale Lofts are located within a three mile radius from the Phoenician Golf Resort and 1,000 new multi-unit urban residences recently completed or in development. Red Mountain Retail Group, Inc.
About this company Red Mountain Retail Group, Inc.